Meetha Chawal is a traditional dessert of North India mostly served during pujas and functions. It is prepared using cooked basmati rice and carefully selected mild Indian spices and ghee. 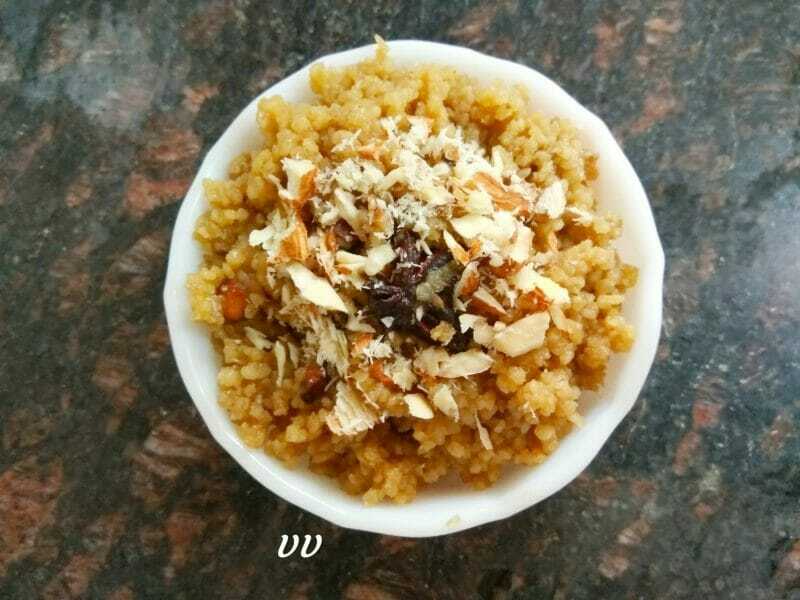 I have used Little Millet for this recipe and substituted sugar with jaggery for health reasons, and it was equally aromatic and tasty. Heat a pan and add ghee. When it is hot, add the spices mentioned above. Once they turn aromatic, reduce the flame to minimum and add jaggery powder. Let it melt and become a syrup. In between mix with a ladle so that it doesn’t burn. Once the raw smell goes off, turn off the heat. It takes just 2 minutes. Mix in salt. Add the precooked and cooled millet and mix well. Leave it for some time so that it absorbs all the syrup and becomes dry. 1. Cooking the millet in milk gives an enhanced taste. A few saffron strands can be added while cooking. 2. Kodo/Barnyard/Foxtail/Proso millets can be used for this recipe.